The U.S. 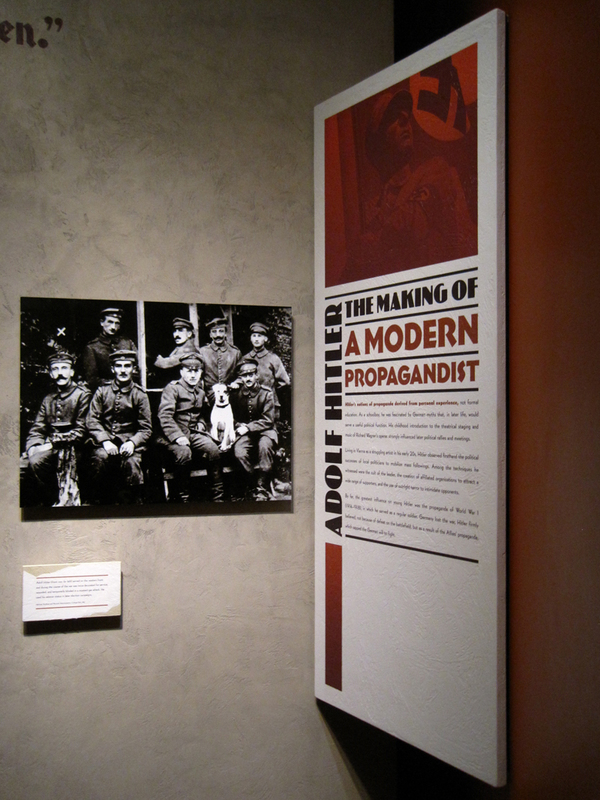 Holocaust Memorial Museum has a special/temporary exhibition “State of Deception: The Power of Nazi Propaganda” that I’d like you all to see. 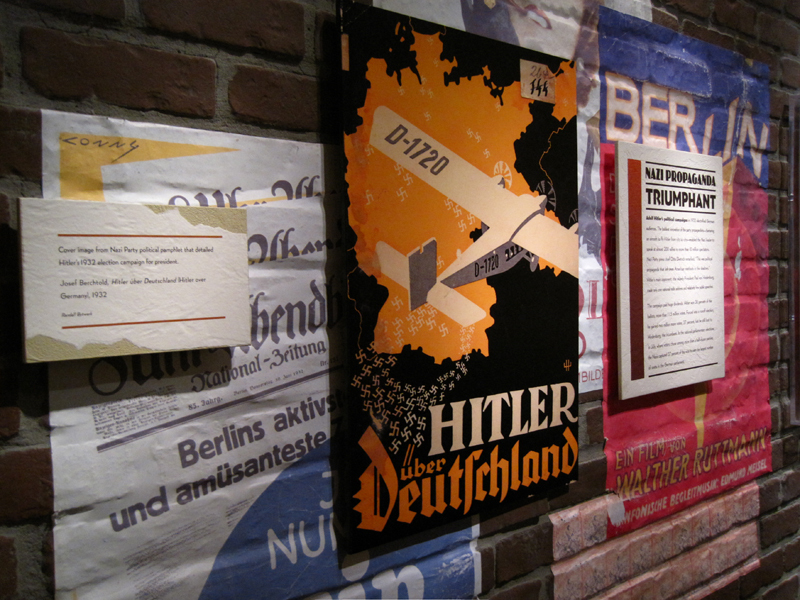 (I know I have a stellar track record of posting about temporary exhibits after they’ve closed, but not this time—“State of Deception” is open through December 2011.) 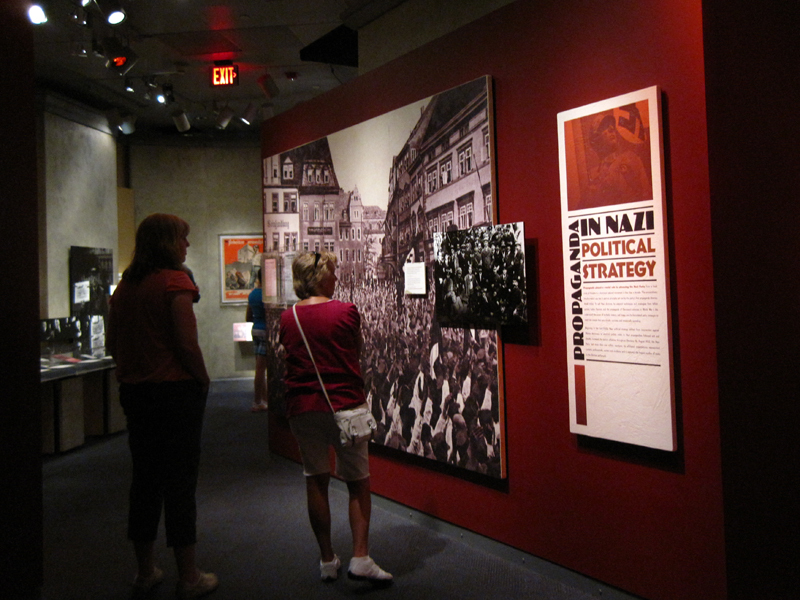 The exhibition, by the museum’s description, “reveals how the Nazi Party used modern techniques as well as new technologies and carefully crafted messages to sway millions with its vision for a new Germany.” There are books, posters, newspapers, and photos to look at, archival sound recordings to listen to, and films to watch. There’s a lot to take in, but the exhibition does a great job of leading you through and presenting its themes clearly and succinctly. I also liked that each graphic is unique—if you look closely, the torn paper and painting texture is all custom done. An interesting thing the designers did was to change the lengths of the secondary and label-level text panels to fit the length of the text. With a relatively small exhibit like this, it works well, though it would certainly be difficult to control for in a larger exhibit. But here it made every panel seem intentional and thoughtful. A lot of care was put into these graphics, and the effect is quite beautiful. I wanted to read every single label. I also recommend that you spend some time with the exhibition’s accompanying website, if you make it to the exhibition in person or not. It is rich with information and the website design ties in well with the exhibition design. Ask me about the “expand to fit” typicals we did for National Msm of Australia. The notion that all labels must be the same size in order to be interpretively or economically effective is … Well….. Nazi-like persuasion. What about controlling for aesthetics? Did you do the graphic production yourself…or did you just have a ton of trust in the fabricator? Oh, I loved this as well but didn’t get around to sneaking photos :) Nice job and great to see it again.